Remarketing Los Angeles | Lancer Media, Inc.
Remarketing, otherwise known as retargeting, is a very popular and effective way of connecting with your website visitors who have not purchased your products or, at least, have not performed a trackable and tangible action, i.e., newsletter signup, contact form submission, etc. An average website conversion rate for our clients ranges from 2% – 7%. These are good conversion rates. However, it still means that 93% – 98% of visitors left without purchasing. There are myriad reasons why visitors leave a website. Some might leave because they were just browsing with no purchase intent; others might leave because the product price is out of their purchase range; still others might leave because they were indecisive but did have purchase intent. So many reasons but you know that there’s a percentage of them that will come back to purchase, if properly nudged. With the assistance of a remarketing company, you can publish text or ads on thousands of other websites that are subsequently visited by people who have previously visited your website. These ads serve as a reminder, a sort of subtle request, to these people to return to your site to purchaser the product(s) they had last viewed and perhaps thought of purchasing but didn’t make up their mind to do so. The method by which visitors to your website are remarketed is simple yet technologically advanced. When a visitor lands on your website, a cookie, also known as a pixel, is dropped that follows that visitor wherever they go on the internet. If the visitor lands on a site that partners with your remarketing company, the visitor is served an ad branded with your logo, message, and product image. Remarketing ads can be varied in their messaging. They can display the product image that was last viewed, display a range of products, serve as a reminder of a promotion, and much more. Executed appropriately, remarketing should be employed as a complement to other digital campaigns. You need to keep attracting visitors to your website. 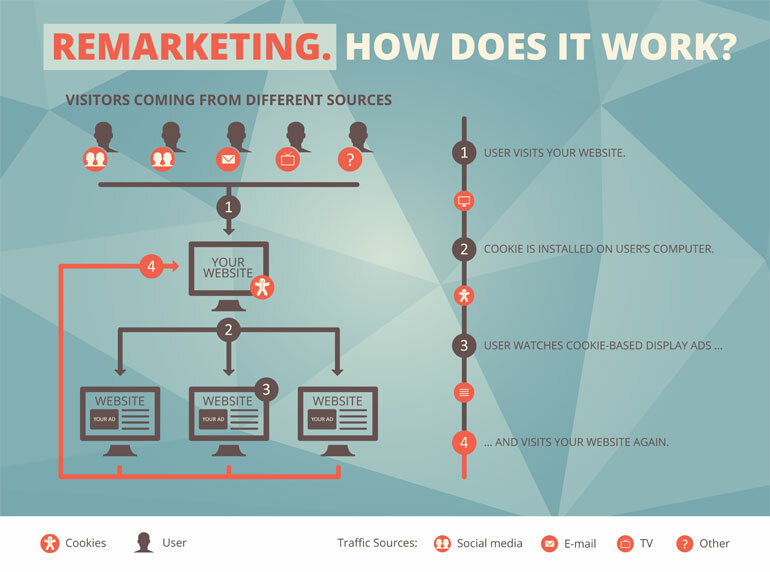 Remarketing targets those visitors, can improve brand awareness and increase sales conversions.